Apostrophe Catastrophes: I guess hipsters can't punctuate. I guess hipsters can't punctuate. 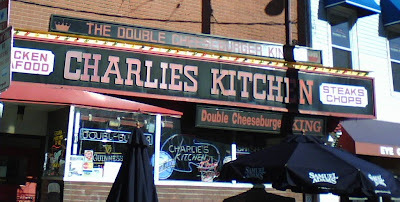 I've walked by Charlie's Kitchen about a million times and never noticed that its sign lacks an apostrophe! The neon sign in the window is properly punctuated, though. Thanks to my friend Merry for taking this photo and sending it to me. I might not be able to go to Charlie's anymore! Especially since they painted over the Morrissey graffiti that used to be outside the bathroom. Wow! I'd never noticed the missing apostrophe either! My goodness! *I* have never noticed this either! I am a little shocked....too bad the burgers are so danged good. Weird, right? If the letters weren't so close together, I might wonder if the apostrophe had fallen off. Whoever sent this fax should be "fired." Pour Some Splenda on Me! This makes me embarrassed to be a Red Sox fan. As Opposed to Head Halves? I Thought Macy's Had More Class!